It’s been a while since I ranted about peanut butter. Remember those Peanut Butter M&M Cookies? The one’s that were so delicious, even my non-peanut-butter-loving brother ate? Yup, those one’s. Did you make them? If you didn’t, it’s okay, but you really should. They are totally worth it. You know what else is worth it? 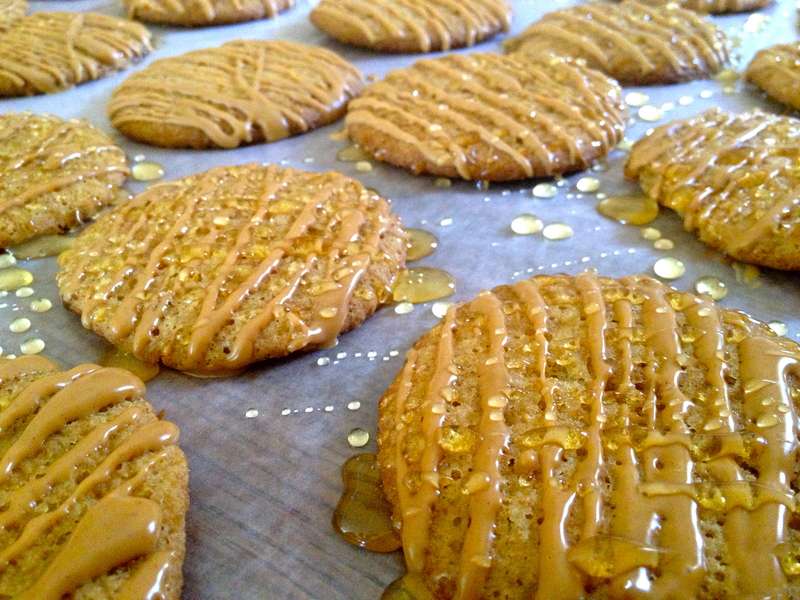 These Peanut Butter & Honey Graham Cracker Cookies. Did I ever tell you that I don’t like jelly? As in I don’t eat it. Ever. Unless someone holds a whisk to my head and says ‘eat it or I will never let you bake again’—don’t worry that hasn’t actually happened yet. I just don’t like it. The texture, the flavors [yes, I’ve tried plenty of them], and the mushy appearance…really everything about jelly is a huge turn off for my tastebuds. Are you wondering if my dislike for jelly extends to peanut butter & jelly sandwiches? The answer is that, yes, it does. When other kids were pulling out peanut butter & jelly sandwiches from their paper bag lunches, I would happily be pulling out a plain peanut butter sandwich. Usually half a sandwich. With the crust cut off. It wasn’t until much later that someone told me about peanut butter & honey sandwiches. I was skeptical. Honey with my peanut butter? Could it taste good? Or, would it be just a less chunky version of jelly? Needless to say, it is not like jelly. And even though I still prefer plain peanut butter sandwiches, occasionally I mix in some honey. Because, in actuality, it’s not half bad. It’s actually kind of delicious, which is why I had to make it into a cookie. 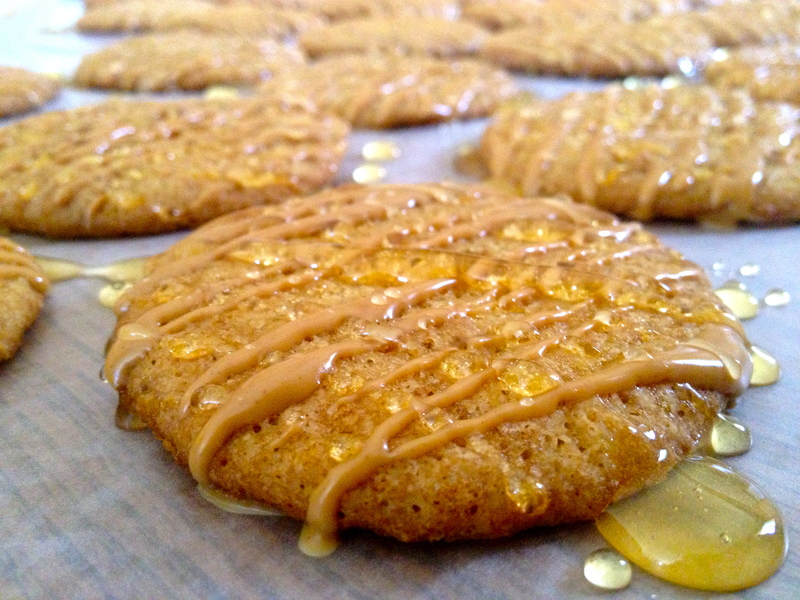 Say helllllo to the tasty Peanut Butter & Honey Graham Cracker Cookie. This cookie tastes just like a peanut butter & honey sandwich. And that is in no way an exaggeration. The Peanut Butter & Honey Graham Cracker Cookie itself is graham cracker based and picks up the lightly sweetened honey flavor of a regular graham cracker. This super soft, moist, and melt in your mouth cookie is then drizzled generously with both peanut butter and honey. The creamy peanut butter drizzle and the sweetened honey drizzle combine perfectly with the graham cracker cookie to give you one mouthwatering dessert. Preheat oven to 375 degrees and spray a cookie sheet with cooking spray. Cream together butter and both sugars, until light and creamy. Add eggs and vanilla. Mix until well combined. In a separate bowl, combine flour, salt, and baking soda. Gradually add the flour mixture to the wet ingredients. Stir until combined. Using a spatula, fold in the honey graham cracker chunks. Drop a generous tablespoon of dough (per cookie) onto the greased cookie sheet. Bake 6-7 minutes or until cookies have a light golden brown color. Transfer cookies to a cooling rack and let them cool completely. In a microwave safe bowl, melt peanut butter until it’s of drizzling consistency (I melted two tablespoons at a time and it took about 45 seconds). Drizzle peanut butter using a fork or spoon over the cookies. 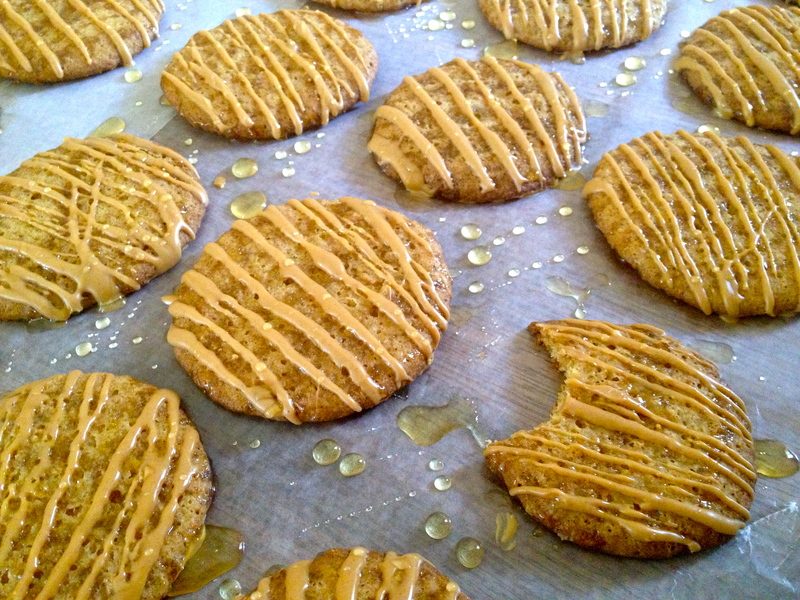 Once the peanut butter drizzle has set, then drizzle the cookies with honey. Let cookies sit for about 8-10 minutes before eating.